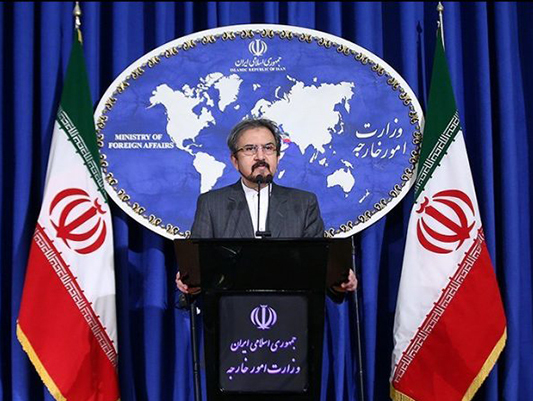 Iran’s Foreign Ministry Spokesman Bahram Qassemi has rejected France’s concerns over the Islamic Republic’s recent missile attacks on terrorists’ positions in the Iraqi Kurdistan, blasting Paris for adopting double standards on dealing with terrorism. In a statement on Thursday, Qassemi said that no country would ever remain silent when it comes to its national security, territorial integrity, and any form of aggression against its people and land. His comments came in reaction to the remarks made by the French Foreign Ministry, which expressed concern about the actions of the Islamic Republic of Iran against terrorists in northern Iraq. In response to a question asked by IRIB news agency, Qassemi rejected such statements saying that the Islamic Republic of Iran had earlier given the Iraqi government and Iraqi Kurdistan authorities warnings about the terrorist moves and destabilising acts of the terrorist group targeted by Iranian missiles last Saturday. Iran has repeatedly and explicitly warned that it takes serious action against terrorism and promotion of violence in all its forms along its borders, and will insist on this principled policy, he went on to say. Qassemi slammed the French government’s silence over the previous terrorist attacks against Iran’s security and territorial integrity, which were orchestrated from inside the Iraqi territory, and urged Paris to adopt realistic approaches in this regard. He stressed that terrorism should be condemned in any form and anywhere in the world without any political considerations, and rejected the adoption of double standards and arbitrary approaches towards the territorial integrity and national sovereignty of other countries. On Saturday morning, Iran fired several missiles at the headquarters of the Kurdistan Democratic Party of Iran (PDKI) and Iranian Kurdistan Democratic Party (KDP-Iran) near Koya district, southeast of Erbil. At least 16 terrorists were killed and 40 others were injured in the attacks claimed by the IRGC.